This is my Ma's own version of the dish. She adds in eggs and beancurd for more variety and to reduce the quantity of pork. It's 'kocha' style. During the 1950's, not everyone can afford to eat pork or chicken everyday especially for the poor. My grandpa used to buy the leftover pork from the butcher and cook in big quantities. My Ma says the family can eat this dish with plain rice, porridge, buns and even fresh bread [roti benggali]. She told us that when the butcher has too much leftovers and when my grandpa could not afford to buy, the butcher will suggest betting. My grandpa will get the pork free if he wins and pay less if he loses. Pound garlic and peppercorns into a paste. Fry beancurd, set aside. Shelled hard boiled eggs. Heat up a heavy base pot, put in pork pieces. Add in pounded garlic and peppercorns, dark soy sauce and sugar. Give it a stir and leave ingredients to cook till meat is firm and well coated with seasoning, about 10 - 15 minutes. Add in light soy sauce, eggs and enough water to cover the meat. Keep boiling for about 30 minutes then add in fried beancurd. Continue boiling till meat is tender. Add a little more water if gravy is too dry and meat is not tender. Stir a few times to prevent sticking. Note: Some people prefers to eat this dish with rice and sambal belacan. This is a home-cooked version of Java Mee [my Ma's own recipe]. She used to sell this noodle during the 1970's to 1980's and her customers love it. When my Ma stopped doing the business, many of her customers were disappointed. Some even asked her for the recipe. Last Sunday, sister-in-law cooked this noodle for the family. Remove skin of sweet potatoes. Wash and cut into big chunks and steam for about 25 minutes till soft. While hot, mash sweet potatoes quickly into a fine paste. Mix paste with about 1 litre water and strain stock into a boiling pot. Discard the rough and fibrous part of sweet potato. Add remaining water to stock, chicken granules and tomato sauce. Boil stock for 15- 20 minutes add salt and sugar to taste [the soup taste sweet and sourish]. Thicken with cornstarch, bring to a boil and off fire. Double boil soup to keep the soup hot and prevent burnt base. Top up with sliced potato, beancurd, tomato, eggs and char siew. Put 2-3 scoops of hot soup over noodles, top with lettuce, fried shallots and lime wedges. Add in fried chilli paste with oil. At present time, not many people will eat cockles either fresh or cooked. My family used to cook this dish to be served with plain porridge 'moy' because cockles were cheap in the past but now it costs RM 3.00 per kg [today's price]. My Ma says she has been thinking of cooking this dish and she looks out for 'meaty' cockles. Meaty cockles are sweet and does not have a salty taste. If you are adventurous enough, give it a try as ingredients are simple. Clean cockles in a basin to remove mud, then soak in water with some salt for 15 minutes. Wash several times. Shelled the cockles then wash cockles in colander 1 - 2 times. Drain in colander to discard excess water. Heat wok with oil and fry ginger strips till fragrant, add in chilli and tau cheong. When fragrant add in cockles [discard excess water], add in dark soy sauce [for colour] and sugar. Stir fry quickly on high heat. There will be some water, when it boils add in spring onions. Stir and dish out immediately [this is to prevent overcooking the cockles and tough]. Steamed buns with fillings especially meat fillings are no longer cheap and the size and fillings have also changed. We are never sure of what makes up the pau fillings. I have with me for sometime this pau dough recipe which I have been using and it's good. This time, I tried making the big meat pau [called Tua Pau in Hokkien] and I am happy with the results. Put in water mixture, followed by flour and instant yeast. Switch bread-maker to dough function. Let it knead for about 5 minutes, then add in shortening. Continue the kneading function till dough is ready. Remove dough to a floured surface, punch down dough and divide into 8 equal portions. Shape into a smooth ball. Set aside to add desired fillings and shape into pleated paus. Leave to prove for 15 - 20 minutes. Steam over high heat for 12 - 15 minutes in bamboo steamer. Off heat and leave paus for a further 3 minutes before uncovering to cool on rack. This is to prevent wrinkle, rough skin. Heat 1 tbsp oil in wok to fry seasoned meat till cooked. Add in water chestnuts and seasoning [1 tbsp each of soy sauce, oyster sauce and cooking wine]. Fry and add in enough water to cover meat ingredients. Bring to a boil and lower heat to simmer till meat is tender. Thicken with cornflour water [2 tsp cornflour + 2 tbsp water]. Add in spring onions and dish out to cool and refrigerate before use. To make paus, divide meat fillings into 8 portions. Each pau should have 1 portion of meat fillings, 1 piece each of chicken, egg and chinese sausage. All stock ingredients removed and chilli paste added. Ready soup with fish meat added. Assam Belai is a spicy, sourish sweet soup almost similar to the famous Penang Assam Laksa with fish [mackerel or sardine] as its main ingredient. The cooking method is simple and ingredients not as much as Penang Assam Laksa as it can be a soup to be served with rice or rice vermicelli [thin rice noodles]. It is especially easy to cook this in Penang since we can get the chilli paste mix from the vendor in Penang wet market. Just tell him how much fish you have and he will sell the quantity needed. Alternatively, we can just blend our own chilli paste [paste consists of dried chillies, lemongrass, shallots, tumeric] and shrimp paste [belacan]. For this recipe, I bought ready mix chilli paste [RM 1.50] to cook 1 kg fish [ikan kembong]. Now this type of fish [mackerel] is available in abundance and it's about RM 3.00 - 4.00 per kg. Boil 1 litre water in a sauce pot. When boiling, add in fish to cook, then remove fish and set aside to cool. Meanwhile add in the remaining 1 litre water, daun kesum, lemongrass, wild ginger, tamarind slices and tamarind mix into sauce pot. Continue boiling till soup is very fragrant. When fish is cooled, separate fish meat from bones. Discard the bones. Set aside fish meat. When soup is fragrant, remove all the boiled soup ingredients and discard. Continue boiling soup and add in chilli paste with belacan. The soup will turn into a very appetising soup [see photo]. Add in fish meat and seasoning to taste [should be spicy, sweet and sourish]. Bring soup to a thorough boil for 5-10 minutes on high heat, then lower to medium heat to simmer for about 20 minutes. If thick soup with more fish meat is preferred than add less water or add more fish. If eating with noodles, then you may need more soup. Heat up to serve with rice and garnish with mint leaves for added flavour. Can add other ingredients such as sliced big onions, chopped wild ginger flower, sliced pineapple, mint leaves and shredded lettuce if serving with noodles. If you have tried Penang Assam Laksa before then it is easy to check the taste of this soup. Can use this soup base to cook other fish [whole] such as mackerel, sardines and various species of stingray. No oil is needed to cook this dish. Above photos show the ingredients and frying process for sago cake [refer previous posting on how to prepare sago cake]. Prepare ingredients as stated above. Heat oil in non-stick pan and fry garlic, shallots and chilli paste till fragrant. Add in dried prawns. Fry for awhile then add in prepared sago cake and light soy sauce and dark soy sauce. Fry till well combined. Taste and add salt/msg to taste. Continue frying till sago cake do not clamp together then add in beansprouts and chives[ku chai]. Fry till vegetables are cooked. Dish out to serve. Some people prefer to eat the dish with additional sambal belacan. Note: This dish can be cooked using dried prawns or fresh seafood such as prawns and squids. Sago is a form of starch and easily found in Malaysia in a form of small beads at sundry shops or supermarkets. It used to be a very cheap ingredient for cooking this dish. My great grandma and grandaunt will usually prepare this for festive praying in the olden days because it is cheap since the family is not well off. How to prepare Sago Cake for frying? To some people it maybe tedious but once you have done it, it is not difficult. If cooking for lunch, you can prepare other ingredients for frying first then only prepare the sago for steaming and cutting before lunch. Mix sago with oil and water in a bigger container with cover for at least 4 hours or overnight. Then bring together the soaked sago and knead it into a compact dough. Press the dough into a steaming tray and steam in boiling water for about 20 - 25 minutes until the dough is cooked and looks translucent. Can steam in several batches depending on the size of the steaming tray. Note - make sure the sago is well pressed to get a nice texture. See photos for preparation of sago cake. After steaming, put steamed sago cake under running tap water to cool and for easy removal from tray. When cool remove sago cake into another container with enough water to cover the cake. To cut - remove sago cake from water, cut into 1" wide strips then cut into thin shreds. Set aside. Not too difficult to prepare if using a slow cooker and definitely very economically as the quantity is enough to serve a family of 10. Best to serve with 'yu char koay' or even plain croissants. I even tried with cream crackers when there is no 'yu char koay' or croissants. Boil enough water in a sauce pot till boiling. Add in peanuts. Boil for a while and drain peanuts in a colander. Do not wash peanuts with tap water. Boil 2 litres water in slow cooker then add in boiled peanuts and screwpine leaves. Cover and continue boiling boiling on high heat till peanuts are soft [takes several hours] then add in sugar to taste [ add more sugar if you prefer a sweet dessert]. Turn slow cooker to low heat to keep peanut soup warm before serving. Alternatively, used boiled hot water instead of boiling water in slow cooker. Note: Was told the peanuts should be washed with hot water so that the peanuts will get soft and tender faster and the texture is like those sold commercially. See photos - already cooked peanut soup. Quantity of water and sugar can be adjusted according to preference. Just like to share with readers [especially from outside Penang, Malaysia] this information. In Penang, cooking various types of curries is really not a difficult task. This is because we can easily buy freshly mix chilli paste/mix at almost all wet markets in Penang. The vendor can even estimate for us how much we need to buy just by letting him know the quantity of our main ingredient such as chicken, meat, fish, prawns or vegetables. Moreover, it is also not expensive. The prices range from RM 0.70 to RM......... depends on quantity of our main ingredients. For example, if cooking 1 kg of chicken with 3 potatoes, we just need to buy RM 2.00 - RM 2.50 [this depends on how spicy you prefer the curry to be]. The curry paste consists of grounded chilli, lemongrass, shallots, tumeric, coriander powder etc that makes up the paste to cook the type of curry you choose. Isn't it easy? Apart from curry paste, the vendor also sells other mixes of spices for cooking other dishes. Below is the list of the common curries and other dishes where the grounded ingredients can be bought from the vendor. We can also buy ingredients separately such as coriander paste, chilli paste, grounded shallots, tumeric paste etc. Note: Appreciate if readers will let me know if these are also available elsewhere outside Penang. Two days ago my Ma cooked this dish [which I mentioned earlier that this is one of the dishes that goes well with porridge]. Usually she uses stingray but this time since she has this fish fillet [I think is 'shark' meat - sua hoo']. Looks delicious isn't it? Try it and your comments are welcome. Prepare the fish fillet and set aside. Squeezed out excess water from soaked preserved mustard leave. Cut into about 1 cm width shreds [see photo]. Sliced and cut garlic and ginger. Heat oil in wok. Fry ginger, garlic and chilli paste till fragrant. Add in fish, fry for awhile and add in vegetable. Continue frying till all ingredients are well combined. Pour in prepare tamarind water. Stir and add in more water if it is not enough to cover ingredients. Add in a little salt and sugar. Bring it to a boil, taste and adjust seasoning. Let it simmer for about 5 - 10 minutes or until vegetables are tender and fish is cooked. The gravy should taste a little sourish and sweet. Note: Be careful when adding salt as some preserved vegetables are salty. This is a nyonya dish and my Ma will cook this dish for dinner to be served with plain white rice or when she cooks 'Nasi Lemak' [coconut flavoured rice]. Believe me, it is tasty and easy to prepare. Trim the tip of prawn's head and shelled the centre of prawns. Leave the head and tail intact [see photo]. Wash and drain. Mix all the seasoning ingredients in bigger bowl with hand. Squeezing well to form a sweet and sour paste. Add in prawns and mix well to marinate. Marinate prawns in fridge for several hours for better flavour. Prepare a wok. Add in marinated prawns. Spread out to fry till almost firm and there will be some gravy. Add in oil at this point and continue frying till the prawns [medium heat] are cooked and moist. Turn prawns to prevent burning or just pan fry the marinated prawns in batches till firm on one side and flip over to cook the other side. Note: When frying with tamarind paste and sugar, it gets burnt very easily if frying on high heat. We were at a temple to pray last weekend. After prayers, we were served this dish with sandwich bread. It was good and not that difficult to prepare. Also goes well with white rice. Prepare the ingredients as stated. Combined the curry paste ingredients and set aside. Heat oil in wok. Add in curry leaves and curry paste to fry till oil breaks. Add in meat and potatoes to fry. Continue frying till well combined [see photo]. Add in seasoning. Fry well and add in milk and enough water to cover ingredients. Fry to mix well, bring to a boil and lower heat. Cover to cook till meat and potatoes are tender. Stir on and off to prevent ingredients from sticking to wok and gravy dries up. Add a little more water if potatoes are not soft but gravy is too dry. When meat is tender, adjust taste and dish out in pot to serve with rice or fresh slices of bread. Note: If cooking smaller quantity, can omit chilli paste and used only pounded shallots, curry powder and tumeric powder. Came across this type of long beans in the market. My Ma prefers this type of long beans [I think it is called snake beans] to the normal type which is thinner and straight, looks greener. She says this type cooks faster, more tender and soft. I prefer this way of frying the beans because it is not that oily. The ingredients are simple yet taste good and goes well with 'moy' [hokkien type of congee] and rice. Pound shallots, chillies coarsely and add in prawn paste [belacan] then dried prawns. Pound till all ingredients are well combined [ not too fine - see photo above]. Heat oil in wok to fry sambal paste till fragrant. Add in beans to fry. Add in seasoning and fry till beans turn bright green colour. Add enough water to cover the beans. Stir to mix well and cover wok to cook beans till tender and soft on high heat and water is reduced about 5 - 10 minutes. Remove cover, stir and adjust seasoning. Dish out to serve. Note: Do not add too much salt as some belacan and dried prawns are salty. Can add more chillies if you prefer it to be more spicy. The same sambal paste can be used to fry other types of vegetables such as sweet potato leaves, water convolvulus [kangkong], watercress, lady fingers, french beans and brinjals etc]. Will post these recipes whenever my Ma cooks the various type of vegetables this way. In Penang, to many people especially the older generations, cooking with fresh herbs is rather common. We have the ulam rice [freshly cut herbs mix with cooked rice etc]. I tried this version of fried rice using some herbs that I grow at home and the result is encouraging. It is very fragrant. Worth giving it a try. Heat oil in wok, fry lemongrass, ginger and garlic till fragrant. Add in prawns or dried prawns. Fry till prawns are cooked. Break in egg, stir and add in cooked rice, tumeric powder and seasoning. Fry to mix well, then add in the shredded vegetables. Continue to fry till vegetables are cooked and well combined with other ingredients. Taste and dish out on plate to serve. Garnish with mint leaves and shredded red chili. 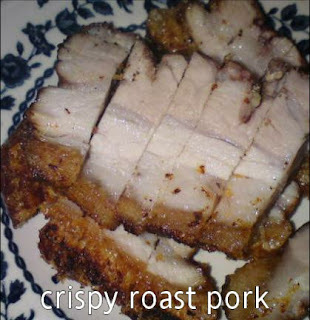 Roast pork or siew yoke is getting expensive these days. In Penang the prices ranges from RM 40.00 to more per kilogram depending on where you purchase them. I searched through some of the food blogs and I was happy to come across a recipe from Reesekitchen which is quite simple for a first timer like me. I gave it a try and it turn out as above. 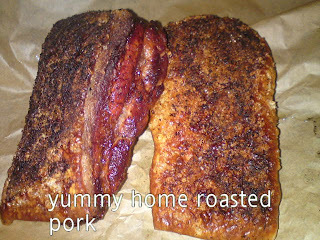 Since I am using a small oven, I have to cut up the piece of pork belly [1 kg] into 3 pieces. The result was encouraging. I can't remember whether I followed exactly the recipe but below are the ingredients and method that I have written down. Wash pork belly pieces. Scald in hot water for 1-2 minutes. Clean and pat dry. Pierce the skin all over [I used a BBQ skewer]. Turn over and make a few slits across the meat lengthwise. Mix together salt, Chinese wine, 5 spice powder and garlic. Rub mixture all over the meat side. Do Not marinate the skin side. Once the meat side is evenly rub with marinade, place on a flat plate, meat side down and skin side up. Leave meat to marinate in fridge for 1-2 days uncovered. This is to dry the skin and get the meat well marinated. To roast pork, preheat oven at 250 degrees C for 10 minutes. Bring meat to room temperature. Place meat pieces [skin side up] on roasting rack on top of a foil covered baking tray. This is to collect the oil drippings and for easier cleaning after roasting. Cover skin evenly and fully with coarse salt. Place roasting tray in the middle level of oven to ensure even roasting. Roast for 25 - 30 minutes. Remove meat from oven and discard the salt from the skin. Return meat to oven but put on the top level to roast for a further 25 - 30 minutes [can alter heat to top only]. In between roast, it is okay to open the oven and dab oil from skin. Continue roasting till the skin is slightly burnt. This is to get a crispier skin. Remove meat from oven and scrap off the burnt skin with a serrated knife. Above photo showed the burnt skin already scraped off. Leave to cool for 10 - 15 minutes before slicing to serve. We usually have bread for breakfast. This is an easy to bake loaf bread using the bread-maker machine to knead the dough [as shown on the top left photo]. Just put the ingredients according to the order below and let the machine complete the dough cycle. Put ingredients into bread-maker pan according to above order. Start the machine and let it knead for about 5 minutes. Then add in [B]. Let the machine complete the dough kneading function. When completed, remove dough from pan on to a floured board. Knock down dough to release air trapped in dough. Roll out into oblong shape. Fold into 3. Turn over and roll out flat rectangle and roll swiss roll [see photo above]. Put dough in a greased Pullman's tin and allow to proof for at least 30 minutes or until the dough reaches to about 90% of the tin. Preheat oven at 180 degrees C for 10 minutes. Bake loaf for 25-30 minutes. Remove loaf to cool on rack immediately after baking. Cool before slicing bread. Keep in airtight container.